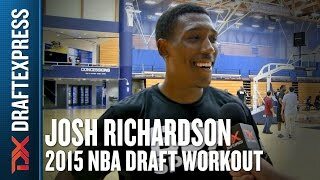 An interview with Tennessee shooting guard Josh Richardson, featuring footage from his pre-draft workouts in Santa Barbara. SEC All-Conference First Team and All-Defensive Team, although he was unable to lead the Volunteers back to the NCAA tournament. Richardson was not highly touted out of high school in 2011, with a 159 RSCI rating after being ranked by just one recruiting service. He developed into a prospect over the course of his career, though, and will look to make a further impression on scouts leading up to the NBA draft. What makes Richardson appealing to NBA scouts start with his physical tools, as he was listed at 6'6 with a reported 6-10 wingspan. He possesses very good athleticism, with excellent speed, both in the open court and with ball in his hands, and a strong first step. Richardson's frame is still a work in progress, which is not ideal for a player of his age as he tends to shy away from contact at times. With that said, while he is a senior, he won't turn 22 until September, making him one of the younger seniors in the country, so there is still time for him to develop. Playing quite a bit of point guard for Tennessee this season, Richardson was forced to shoulder a huge amount of ball-handling and playmaking responsibility for the Vols, which allowed him to showcase some other parts to his game than we saw with him as a role-player next to Jarnell Stokes and Jordan McRae in prior seasons. Richardson did a nice job creating shots out of pick and roll, isolation and transition situations, thanks to his strong first step and solid body control in the lane. He wasn't always able to finish everything he created, though, as he converted just 51% of his 2-pointers and got to the free throw line at an average rate. He can get through traffic off the dribble and he utilizes his length to get off shots, but needs to become a more consistent finisher at the rim or be more willing to accept contact to draw free throws for this to work in the NBA. While not a great passer, Richardson has improved over the past year, raising his assist average from 2.0 to 4.5 assists per 40 minutes pace adjusted, even if his assist to turnover ratio actually dropped from his junior to senior year. A lot of this is due to how heavy a ball-handling role he played this season, and his -0.75 PPR doesn't inspire a lot of confidence in his ability to continue to operate at the point guard position like he was forced to this year for Tennessee. Richardson doesn't always display great vision, as he can put his head down on dribble penetration which blinds him from seeing open teammates around the perimeter. The experience he garnered this season surely helped him, though, and the fact that he can make the extra pass and find teammates in basic drive and dish situations is a definite plus. Richardson has improved as a three point shooter throughout his career, seeing his average rise nearly each season from 24.3% as a freshman on around one attempt per game, to 35.9% as a senior, on four attempts per contest. As a role player in the NBA, Richardson will need to be comfortable spotting up off the ball to space the floor and he showed in his senior season he could potentially fit into that niche, as he shot 39.4% on catch and shoot opportunities. While his release looks very smooth at times, his form tends to waver, especially when rushed, as he tends to jump forward excessively and contort his body sideways when closely guarded, looking very off-balance in the process. When left totally open, Richardson made 50% of his catch and shoot jumpers this season according to Synergy, but that number fell to 36% with a hand in his face. It will be interesting to see how his jumper translates to the much further distances of the NBA 3-point line, as this will likely be one of the biggest keys to whether or not he's able to carve out a niche in the NBA. He shot just 31.8% for 3 over the course of his college career, so teams will want to see if his marked improvement as a senior was a fluke or it is something more sustainable. Finding a consistent and repeatable shooting stroke will be important for him as his career moves forward. Defensively, Richardson has the potential to have a positive impact on this end as he has a nice combination of physical tools and energy level to help a NBA team. He will need to add strength to his frame to help compete against NBA players but his size, length and agility gives him a nice starting point. This was manifested in his steal rate, as Richardson averaged 2.1 steals per 40 minutes pace adjusted one of the top rates among shooting guards . He uses his length to jump into passing lanes to intercept passes or to pick the opposing ball handler with his long arms. His individual defense isn't fully developed, as Tennessee relied on zone defense for much of the season, so Richardson wasn't matched up against offensive players on a regular basis. On defense, he had a tendency to roam the court aggressively, looking to force turnovers but taking himself out of position. In on-ball situations, he wouldn't always be in a strong defensive stance which leaves him susceptible to getting beat off the dribble. He will need to keep his energy level high defensively, while adjusting to the defensive schemes of NBA teams to provide value on this end. His physical skill-set will help but he will need to grasp the concepts of defensive schemes as well to become a complete defensive player. There's little doubt that he has what it takes to get there when he's able to focus more heavily on this part of his game and not worry about foul trouble. There are several aspects NBA teams will like about Josh Richardson's skill-set and showing he can fill a certain role for a team will be critical for him in the upcoming months to impress scouts. While his defensive potential is clear, it would be helpful to show he can be a lights-out catch and shooter player as a potential 3 and D player at the next level. Richardson will need some strong pre-draft workouts to impress NBA scouts to be included in the NBA draft discussion, after electing to skip the Portsmouth Invitational Tournament.